Here at Business Plan Nigeria, Our aim is to objectively and rationally uncover the strengths, weakness, opportunities, threats that a given project may present with regards to the available resources in a given environment ultimately determining the success or failure of the potential project. 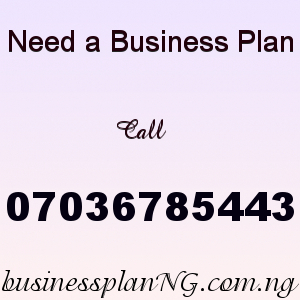 We provide business ideas and tips you need to know about business and how to start both small and large scale business in Nigeria, we also provide detailed Business Plans and Feasibility Study written by experts in their various fields to assist and help you plan and know all you need to know about that business you are planning to start. Our feasibility studies are objectively analyzed based on both quantitative and qualitative data, which enables our client project managers and senior management to proper investigate the measured potential outcomes of a project before investing too much time and money in the project thereby reducing risk significantly.